Don't Believe the Lines. Don't Believe the Hype. Whenever a new console launches in Japan, people line up. And whenever there are lines, there's often press there taking photos. During the last several hardware launches, I was there, doing just that. For Kotaku coverage, I always try to take as many pictures as I can at several different stores to get a better feel for how something's doing. Still, whenever you see a line of Japanese people on TV or in a magazine, don't believe it. Don't. In Japan, lots of people waiting is typically equated with success. This is why hardware launches are such a big deal in Japan. 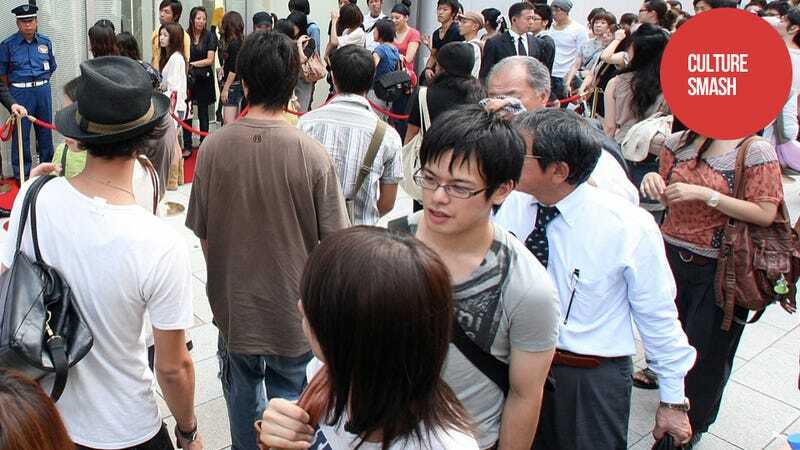 In recent years, because of overwhelming crowds, more and more Japanese retailers are offering pre-orders, cutting down on the first day sales panic. Paid line standers are called "sakura". Jaded as I am, seeing people waiting outside a ramen shop always makes me wonder, are these people paid shills? Popular restaurants in Japan do draw lines. It's the same anywhere, really. Certainly, not every line is filled with phony customers, but there are people, such as Kinect line-stander "Butch", who claim to be professional shills. That soft power, the ability to make people wait, transfers to the cult of celebrity. In the past, famous folks (think The Beatles) arriving at airports was a big deal. Over the years, it's become less so. The crowds that greet celebrities at the airport these days are paparazzi. The Japanese mass media takes great interest in how many people are waiting for something. Whenever a new console launches, Famitsu always provides headcounts—usually rough estimates. Those numbers are then often picked up by Western sites, Kotaku included. This is neither a good thing or a bad one, it exists. From the reporting I've seen Famitsu numbers tend to stand up, but the TV media is often suspect. Earlier this week, a recent Fuji TV broadcast showed the arrival of South Korean female pop outfit Girls' Generation in Narita airport, stating that approximately 800 people were in line. A photo of the line that wasn't aired showed far fewer people. "They've got one zero too many," one netizen joked. A Japanese tabloid exposed what's apparently a sakura flier for another Korean star Jang Keun-Suk, who made his singing debut in Japan this April. According the flier, would-be shills were offered ¥2,000 to be at the airport when Keun-Suk arrived at Narita airport on July 27. The flier requested high school girls and women up to 49 years old. Those participating would be bussed to the airport. While initial reports said 800 people waited at the airport for Keun-Suk, apparently around 100 people apparently turned up when famed actor and singer arrived. According to the article, 80 of them were sakura. Twenty of them were Keun-Suk diehards. Some members of the Korean media have accused the tabloid of fabrication, saying its simply another example of anti-Korean sentiment. So is it pro Korean sentiment with a TV channel says that 800 people turned up to see Girls' Generation? These events are PR. Just as most console launches are PR. When Microsoft held its official Xbox 360 launch in Shibuya, it said the Xbox 360 consoles sold out. It might have sold out at the one shop with assembled press, but at shops across the country, it was another story. With the importance of bricks-and-mortar retailing on the decline, the number of people waiting in line is increasingly become less and less important. If you want to know how popular someone really is, don't look at the crowds. Check the sales numbers.